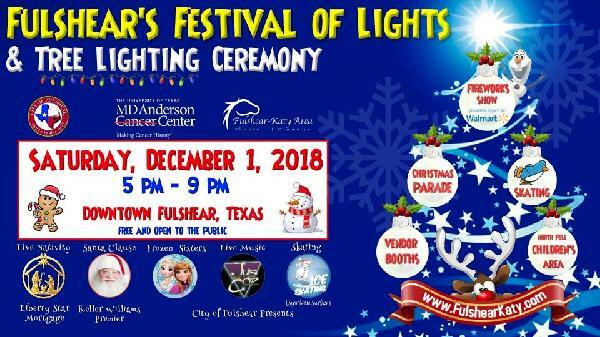 This year’s Fulshear Festival of Lights will be held on Saturday, December 1st, 2018 from 5:00 p.m. to 9:00 p.m. in downtown Fulshear. We are kicking off this year’s event with the Fulshear Tree Lighting Ceremony which will begin at approximately 5:00 p.m. and include a Community Carol Sing-along led by the First United Methodist Church Chancel Choir. The tree will be located on FM 359 in the AceHardware parking lot. Following the ceremony, there will be a Christmas parade with holiday floats, marching bands and prizes awarded for the best-decorated float! Some additional highlights of this year’s event are a 2,000 square foot synthetic ice-skating rink, photos with Santa, the band “Jus Coz”, inflatables, the Frozen Sisters, a Gingerbread Man, a live manger, snow machines, vendor booths, food trucks and much more! The evening will conclude with a spectacular fireworks show choreographed to the music.